The author is some denier blogger called Larry Kummer. 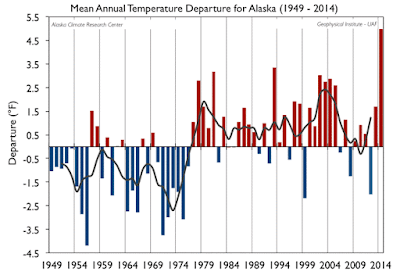 Near the top of his article he posted a chart of Alaskan surface temperature. I'll post the same, but from the source - the Alaska Climate Research Center. Look at the bar on the right hand side! See how hot is was last year? Way hotter than any year since reliable records began in 1949. See too how much hotter it was from 1979 onwards, compared to the earlier period. We see that last factor at work [ignoring the host of research facilities] in journalists’ reporting about Obama’s climate campaign tour of Alaska. Google News shows no stories in the mainstream news mentioning the findings of the Alaska Climate Research Center. After reading that you'd think that there was a difference between what was reported about the changing Alaskan climate during the President's visit, and what the scientists at the Alaska Climate Research Centre have found. Not even in the WUWT article. Larry copied slabs of text from the Center's website. The gist of it was about how the temperature in Alaska is strongly influenced by the Pacific Decadal Oscillation (PDO) as well as global warming. That is, the temperature isn't increasing steadily over time. Instead it's going up in steps, jumping up to a new level when the PDO is in its warm phase, then steadying when it's in the cool phase. The 2014 jump could be another sign that the PDO has indeed shifted back to a warm phase. Again, none of that is particularly contentious. It doesn't conflict with anything the President said. As you can see, it's all consistent. There is a long term warming trend, which was punctuated by a "cool" (which wasn't actually cold compared to earlier decades, as you can see), when the PDO entered a cool phase. Below is a chart showing the phases of the PDO, for comparison. It also shows global surface temperature changes, and ENSO events. I've suggested that there may have been a phase shift to warm starting last year - but don't hold me to that. As you can see, the phases aren't regular. Some are shorter and some last for longer. Journalists pay for this in lost credulity. Publishers of the news pay in lost credibility. We all pay, as these repeated cries of “wolf“ diminish our ability to respond to serious warnings. From the mixed "thoughts" expressed under Larry's article, a lot of readers were as perplexed as I was. They didn't know what to make of Larry's article. And I don't blame them. Based on the abstract I would say the authors are reporting a long term warming modulated by PDO oscillations. This is in agreement with the first graph where the temperatures were mostly above average in the first decade, despite the reported negative phase of the PDO. Brett Keane doesn't think the PDO has shifted. He claims the cool phase has barely started. Does he know that it started around 1999, about sixteen years ago? He's betting on it lasting another fifteen years I suppose. Perhaps he thinks that 2014 was just a random blip, which it might have been. Time will tell. However I won't be surprised if 2015 is also a big blip. Aran, the scientists are trying to tell you something, and it is worth remembering that multi-decadal averages, used as anomalies, change as a regime shift continues. The negative PDO has barely begun, and it is a 32yr phase, on average. I can see Nick Stokes scratching his head over Larry's article, too. He remarked on the fact that much of the text that Larry copied and pasted was from 2010. Five year old articles and three year old papers are not usually called "news". Well, it’s not really news. The text on the page referenced does not seem to have changed since June 9 2010. And the paper referenced (available here) was published in 2012, reviewed by WUWT here in early 2013, and uses data to 2010. Editor of the Fabius Maximus website (aka the article's author, Larry Kummer) is amazed. I'm amazed that he's amazed. All he did was muddy the waters more. He cleared up nothing at all. I wonder what he thinks he wrote? Perhaps he left out a big chunk of the article by accident. Or maybe he really does think he's made some important statement, only he forgot to write it down. This is evidence from relevant scientists pertinent to the President’s statements during his recent publicity tour. That is what makes it news. I am amazed I had to point this out to you. Speaking of news, Matthew Morse wonders why Larry didn't mention a more recent article by the same authors of the 2012 paper. Being published last year, it has a greater claim to the label "news" than the older paper does. Curious about why you didn’t cite Strong Temperature Increase and Shrinking Sea Ice in Arctic Alaska by G. Wendler, B. Moore, and K. Galloway (at the Alaska Climate Research Center), published in The Open Atmospheric Science Journal in 2014. Same authors, more recent pub. date. Seems relevant. It even cites the paper you refer to. Barrow, the most northerly community in Alaska, observed a warming of 1.51°C for the time period of 1921- 2012. This represents about twice the global value, and is in agreement with the well-known polar amplification. For the time period of 1979-2012, high quality sea ice data are available, showing a strong decrease in sea ice concentrations of 14% and 16% for the Beaufort and Chukchi Seas, respectively, the two marginal seas bordering Northern Alaska. For the same time period a mean annual temperature increase of 2.7°C is found, an accelerated increase of warming over the prior decades. Looking at the annual course of change in sea ice concentrations, there is little change observed in winter and spring, but in summer and especially autumn large changes were observed. October displayed the greatest change; the amount of open water increased by 44% and 46% for the Beaufort and Chukchi Seas, respectively. The large amount of open water off the northern coast of Alaska in autumn was accompanied by an increase of the October temperature at Barrow by a very substantial 7.2°C over the 34 year time period. Over the same time period, Barrow’s precipitation increased, the frequency of the surface inversion decreased, the wind speed increased slightly and the atmospheric pressure decreased somewhat. Oh Nick, as you know Barrow has a famous UHI problem, 3C mostly in Tmin so you can’t really trust its data to be representative of the climate in the region. But I’m sure you’ll argue for it anyway, since bad data never seems to phase you. I'm not disputing an urban heat island effect at Barrow. I'm suggesting that it didn't cause the sea ice to melt. And I'm also suggesting that the scientists at the Alaska Climate Research Center know about it. I'll go further and suggest that Barrow and regions have been warming up in recent years, along with quite a few other places in the Arctic. I'll go even further and state that while the 2003 paper documented a difference in temperature between central Barrow and surrounds, on calm days in winter, it didn't say anything much about the trend of temperature change over time. In other words, it's likely that UHI didn't cause the rise in temperature in recent years in northern Alaska. The temperature in the village rose, and so did that of the surrounds. It's another case of Anthony tripping over his anomalies and baselines. richardscourtney piped up saying that if you remove all the warming from the Alaskan temperature record then you'll be left with no warming. Huh? Same would apply if you took out all the warming from the global surface temperature - there'd be no warming. Duh! ...As the above graph shows, if you “take out” the PDO shift in 1976 then there is almost no global warming in Alaska since 1949 and none if you also exclude the single year of 1914. A single year does not a true trend make. I'll finish with another thought from Aran, (who I don't recall seeing at WUWT before today). This is a very strange article. The author claims to give the “news” that has not been reported by journalists during Obama’s visit to Alaska, yet the data and the article he cites fit perfectly with the predictions of global warming and polar amplification which cannot be explained by UHI or solar activity. So if anything this post provides support for Obama’s stance. Re the UHI in Barrow: The effect of that is lowering the temperature increase. It works like this: When it is cold there is more need for heating by burning gas/oil etc. Then the minimum temperature will be higher i Barrow than outside Barrow. When it gets warmer there will be less need for the heating that produces the UHI. And the difference will be smaller between Barrow and outside Barrow. In a warming climate there will be less heating and less UHI. The UHI wil introduce a negative bias for measurements inside Barrow. I guess Watts did not consider that effect. For whatever reason(s), the Alaska Climate Research Center at the University of Alaska Fairbanks engaged in the same sort of start point cherry-picking as the no-warming-since-xxxx crowd. Possibly it was due to a lack of a strong statistician in the very small group, or maybe because it has been emphasizing the role of a multidecadal PDO effect. A 2012 paper by ACRC researchers (Wendler et al., The First Decade of the New Century: A Cooling Trend for Most of Alaska, The Open Atmospheric Science Journal) has figures, plots and regression analysis that appear to have been done using Microsoft Excel. This is hardly fatal, but doesn't inspire confidence either. Magma, if you read the acknowledgments in "Strong Temperature Increase and Shrinking Sea Ice in Arctic Alaska", Wendler thanks Gerhard Kramm for "helping us in various ways to improve the manuscript". Between him and Akasofu there's quite the little group of non-publishing deniers over at IARC, including Kramm's wife Nicole Moelders. There's a bigger political overtone here, Fairbanks is famous for it's poor Winter air quality caused by unregulated wood burning. Moelders grad student, Huy Tran finished his PHD in 2012 and part of it was looking at what would happen if the Borough (read: government solution) paid for people to upgrade to certified woodstoves. The problem he ran into, is that there isn't a sufficient woodstove database for this region and with all the anti-regulation paranoia in this state there probably will never be. Kramm was on his committee. So in other words, we have a terrible air quality problem, local government lacks the information on who are the worst polluters and the only way to clean up our air is to have a governmental agency step in. Enter Gerhard Kramm who then assures everyone around town that in no way can the air quality be cleaned up because the his grad student showed the woodstove changeout program would have negligible affect. What he neglected to mention is that conclusion was based off of lack of information, the modeling portion of his student's thesis showed that up to 50% of the PM 2.5 load could be reduced by a wood stove changeout. Kramm has no qualms lying to the public on an issue that requires government intervention, i.e. human caused climate change or the woodsmoke issue. I've called him on it in the past and his usual response is to throw a bunch of gobbledygook math at me that has nothing to do with the topic at hand and then claim that I know nothing about GFD because I refuse to talk about Von Karmen streets when the topic is climate. Anyway, UAF has it's kook's who can't get any legitimate climate papers published yet still like to have their fingers in climate research. I don't really know how much Kramm has influenced Wendler, but I suspect it's a small amount. I just had to post one of Kramm's comment here for the laughs. "And people living in Interior Alaska have the right to heat their homes and, if available, the livestock buildings"
Newsflash Kramm, the majority of livestock in Interior AK don't live in the PM 2.5 non-attainment area (urban Fairbanks and North Pole). He's so anti-regulation he has to build a strawman situation to justify his stance! Chase Stoudt: useful background, thanks. "He pays more heed to scientists in Cincinatti and Montana and Newark than the local Alaskan scientists." The city is Cincinnati, if you please. Is this related to the idea put forward by some that the Alaskan average temperature has not changed much since the 1970s? With the exception of Barrow of course which appears to be heavily influenced by Polar Amplification. So was Larry Kummer trying to spin this into a "lying by omission" narrative with Obama as the fall guy? When you look at the geography of Alaska, you can see it varies by a lot. The panhandle is dominated by the Japanese current etc. It does indeed seem as if a major climatic shift happened in the 1970s which then leveled out. But all this shows is the climate change is dominated by regional variability. Alaska 1.718 million km² is almost as big as Queensland (1.853 million km²), which has different climate zones; and about three times bigger than Texas (696,241 km²) and four times bigger than California (423,970 million km²). So yes, it's big, with different climate zones I expect. If you look at the top chart, you can see it was consistently warmer in the late 1990s, toward the end of the last warm phase of the PDO. And last year the temp jumped hugely. As I understand it up north it's been getting a lot hotter quickly. The link below has charts for different places in Alaska. Some are warming faster than others, as you'd expect. If you look at the 1990 Plant Hardiness Zone map from the United States Department of Agriculture, there are at least 13 zones. They compress a lot from the shore inward. It would be interesting to see the land surface temperature trends superimposed over the plant hardiness zones. As warming continues, I would guess the temperature extremes of the different Alaska zones begin to moderate some, much as the extremes from the tropics to the Arctic has. The U.S. Plant hardiness zone map was modified in 2012. Jeff Masters at Wunderground had a good discussion. Surprise, surprise - warmer temperatures caused all the zones to move northward! Yes, but for Alaska, it would show a west to east warming and not just a north to south warming. Out of curiosity, I found plant hardiness zone maps for Alaska for 1990 and 2012. The map at Wunderground I linked above shows only the lower 48 states. Comparison is tricky because the colors have changed, and the zones are much more detailed than in 1990. But one thing that's interesting is that zone 2 (second coldest) has intruded into zone 1 (coldest) from all sides, not just west to east or south to north, as we might expect. I had to comment on this. One of the authors of the paper cited in blaming the warming in Northern Alaska on UHI, Dr. Anna Klene, was my undergraduate adviser in physical geography. As per usual, Anthony misrepresents research results, as she often talked of her research in Burrow and how the UHI was affecting local temperatures and such. However she also made clear it was not the case that this bore any reflection on global warming or the amplified trends in the Arctic, only that it affected local changes due to the melting permafrost in town and the assorted problems associated therein. I am sure that if she were to read this (or try to stomach Anthony's anti-science blog), she would make it clear again for all who would listen. Bottom line, not that this is news to anyone here, but once again, Anthony Watts misrepresents real scientific work to suit his agenda and is not to be taken seriously. The current editor of the FM [Fabius Maximus] website is Larry Kummer. He has 37 years experience in the finance industry in a variety of role. Until October 2013 he was a vice president and senior portfolio manager at UBS. A minor aside - I recently wrote several comments on WUWT on posts by Easterbrook on Cascade glacial retreat and by Ball on the inherent worthlessness of GCMs. The first included many libelous comments from readers directed at glaciologist Mauri Pelto, who has carried out 32 consecutive seasons of summer fieldwork in the Cascades monitoring glacier advance and (mostly) retreat on a shoestring budget. None of this will be a surprise to regular readers here. For so-called skeptics, the WUWT regulars certainly do not like to be challenged. To me, the interesting question is why the site's moderator(s) is/are parsing critical comments for a sender's email and/or identity. That's quite a review. You have not given a rebuttal so much as ignored the excerpts given. I quote the scientists at the Alaska Climate Research Center -- with almost no analysis or summary (which you call "spin"). Several of your comments disparage them. So I'm the "denier". That's logic? You ask what is significant of this, esp the relevant to the President's tour? The ACRC shows that Alaska has had little warming since 1977, and the warming shift from the 1949-1975 resulted from a non-anthropogenic effect (i.e., the PDO). 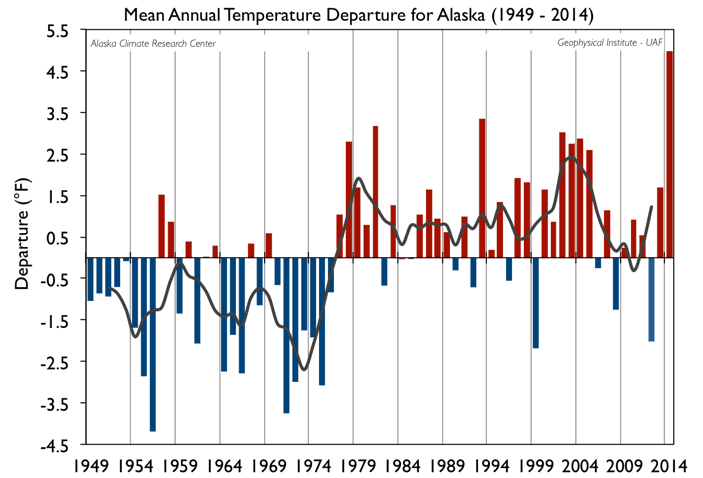 That's 38 years with little anthropogenic warming -- making Alaska an odd spot for Obama to highlight AGW. Note: my primary source for info about climate change is the IPCC, which I strongly defend. What about the warming in 2014? ACRC: "It can be seen that there are large variations from year to year." What about the 2014 paper about warming in Barrow? ACRC: "…little additional warming has occurred in Alaska with the exception of Barrow and a few other locations." My subject was, like Obama's, Alaska. What about Watt's comments? Not my problem; I don't care what's in the comments. Nick Stokes says that the ACRC's text changes little from year to year. They update the numbers each year, changing the text as necessary. I doubt they care what Stokes thinks. That's quite a response. You have not given a rebuttal so much as ignored the excerpts given in the above article. You've also ignored the quintessential character of your nom de plume - Quintus Fabius Maximus Verrucosus – by going 'head-to-head' with the author of this article. If you work on it, you'll eventually be able to figure out how your comment has amply demonstrated one of the childhood characteristics of QFMVC. Should this have been a rebuttal, Larry? Is that what you were expecting or hoping for? Sorry to disappoint but your article was too devoid of point for any rebuttal. I did pose a question - what was the punch line to your article? Did the editor cut it or was there none? Vanity google on a slow afternoon? "In summary, the long term observed warming of Alaska of about twice the global value, as expected by the increasing CO2 and other trace gases, is sometimes temporarily modified or even reversed by natural decadal variations. This is not the first observed occurrence that can be found in the historical record of Alaska , as the 1920’s were warm, and starting in the mid-1940’s a cold period occurred lasting some 3 decades, after which it become warm again." For the purposes of Obama-bashing in this case, you have to be a careful data miner.